TaskExchange is an online platform that connects people working on evidence synthesis projects with people who have the time and expertise to help. There has been a recent increase in the number of opportunities for consumers (patients, care-givers, family members and service users) since the introduction of the new Peer Review Policy. Consumers have shown an interest in a more targeted approach to discovering volunteering opportunities with Cochrane. Two recent webinars introduced Cochrane’s consumers to TaskExchange and we have been encouraging more people to join the platform to find opportunities that meet their interests. 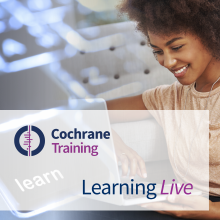 This video, originally part of the Cochrane Learning Live webinar series, is aimed at all Cochrane Review Group teams. Richard Morley, Cochrane's Consumer Engagement Officer, provides an introduction in the context of the new Peer Review Policy. Dr Emily Steele then introduces TaskExchange and demonstrates how to post consumer tasks to find people with relevant interests and skills. The webinar was organised in March 2019 on behalf of the Consumer Network by the Membership, Learning and Support team, and the team behind the TaskExchange platform. Below you will find a video from the webinar, together with accompanying slides to download [PDF]. Dr Emily Steele is the TaskExchange Community Engagement & Partnerships Manager, and holds the equivalent position for Cochrane Crowd, Cochrane’s citizen science platform. She holds a PhD in epidemiology, a Masters of Public Health and began her career as a physiotherapist. She is also an avid nature-lover, handloom weaver and book worm. Richard Morley is the Cochrane Consumer Engagement Officer. Richard supports the engagement in research of a growing community of healthcare consumers (patients, carers, and the public), and Cochrane groups and authors who wish to involve consumers in producing and disseminating Cochrane evidence.